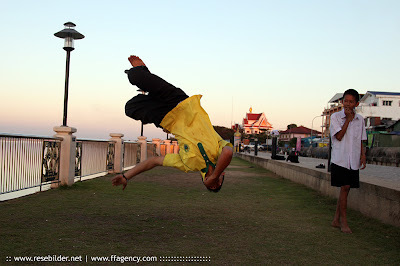 Spectacular performance by freerunners in Nong Khai, Thailand. Photo by Anders Thorsell. Freerunning is a form of urban acrobatics in which participants, known as freerunners, use the city and rural landscape to perform movements through its structures. It incorporates efficient movements from parkour, adds aesthetic vaults and other acrobatics, such as tricking and street stunts, creating an athletic and aesthetically pleasing way of moving. It is commonly practiced at gymnasiums and in urban areas (such as cities or towns) that are cluttered with obstacles.